While Adrienne and Stephen get ready to play our final round, it's time for us to play a game. 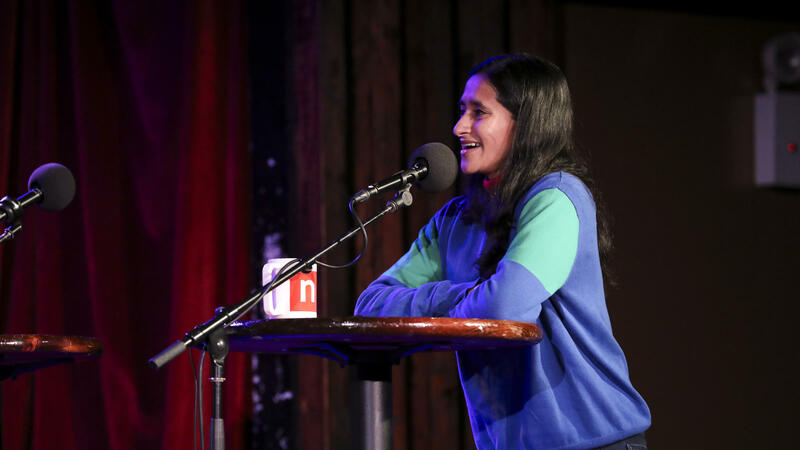 Please welcome back to the stage Aparna Nancherla. EISENBERG: OK, Aparna, this is called Fact Bag. I have a bag full of trivia questions written on envelopes. You, Jonathan and I do not know the answers. So I'm going to read a question. We'll discuss. And then I'll open the envelope to find out the answer. OK, here we go. According to Merriam-Webster, what does the word pumpernickel literally mean? EISENBERG: So what are the characteristics of the bread, I guess? Heavy, it's like a heavy bread. JONATHAN COULTON: Brown. It's rye, right? Does it have rye in it - caraway in it? EISENBERG: It's full on nickel. It's made mostly from shaved nickels. Maybe it's someone who's dumb. I don't know. NANCHERLA: Oh, yeah, like a dense loaf. COULTON: It means like a dumb person. EISENBERG: Yeah. Yeah, yeah, yeah. COULTON: Yeah, I hate that guy. He's a real dense loaf. EISENBERG: Yes, I think that's the answer. COULTON: I like that. Dumb guy. I think that's a fantastic, out-of-the-blue answer. And I think we should go with it. EISENBERG: Well, the answer is pumpernickel means farting goblin. NANCHERLA: We were so close. COULTON: We would've worked around to it. EISENBERG: ...The word was first used in 1738. It comes from the German pumpern for breaking wind and nickel for goblin or devil. Apparently, early recipes of pumpernickel bread were notorious for causing flatulence. EISENBERG: OK, according to scientists, what animal effectively uses its tail as a fifth leg, making it the world's only known pentapedal animal? COULTON: Tail as a fifth leg. EISENBERG: I mean, I think of Tigger from "Winnie The Pooh," right? Didn't he bounce around? COULTON: Yeah. Does it say if it's a fictional animal or a real animal? COULTON: Probably a real animal. EISENBERG: ...It's the world's only - yeah. So it's not Tigger. COULTON: ...Monkeys are pretty - they got pretty good tails. EISENBERG: They got pretty good tails. But don't you think it has to be, like, a very dense tail? COULTON: What - to be used as a leg? NANCHERLA: Like a dense loaf of a tail, yeah. EISENBERG: (Laughter) A dense, loafy tail. COULTON: Oh, wait. What about a kangaroo? COULTON: ...They've got big tails. And they're always - aren't they always, like, sitting back on their tails? EISENBERG: Yes, they are totally sitting back. You're totally right. NANCHERLA: It's got to be a kangaroo. EISENBERG: I'm just opening this right up and telling Jonathan Coulton he's correct. Ha, the red kangaroo. EISENBERG: Scientists in Burnaby, Canada, studied the way red kangaroos walk. They found that red kangaroos used their tails to propel themselves forward with more power than the rest of their limbs combined, essentially making its function as a fifth leg. OK, last fact. Pluto has a geographical feature called the Tombaugh Regio. What is it shaped like? OK.
NANCHERLA: I didn't even know we were still talking to Pluto. EISENBERG: I know. It's interesting you say that because we bought a mobile, and it doesn't have Pluto - of the solar system. It doesn't have Pluto. EISENBERG: And my husband is, like, up in arms about it all the time. EISENBERG: He's like, we should add Pluto. I'm like, but maybe that's not what we should add. Maybe we should be moving with the information that is contemporary. EISENBERG: And he's super upset by - that Pluto doesn't exist. NANCHERLA: I mean, it feels like a band broke up. And you're like, I miss Pluto. COULTON: ...Or a broken heart. NANCHERLA: Or it's like a teardrop tattoo. Pluto murdered someone. EISENBERG: It murdered solace (ph). OK, I think we like that. Tear, or what did you say, broken heart? COULTON: Sure. Maybe it's shaped like a farting goblin. EISENBERG: The answer is a giant heart. EISENBERG: The region was first seen in 2015 in a photo of Pluto taken by the New Horizons probe. Covered in nitrogen ice and shaped like a heart, it was named after the astronomer Clyde Tombaugh, the man who discovered Pluto. All right. Well, that's it. Our fact bag is empty. Oh, thank you, Aparna. Aparna stars in "Corporate" on Comedy Central. Give it up for Aparna Nancherla, everybody.